CANalyzer is the comprehensive software tool with intuitive operation for analysis and stimulation of network communication. Use CANalyzer to check whether and what type of communication is occurring on the network. 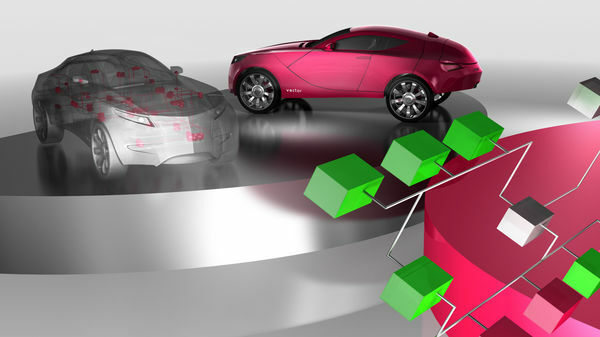 In addition to sending or recording data, interactive ECU diagnosis is also possible. For every application it offers powerful basic functions for beginners as well as extensive detailed functions for experienced users. Trace Window for listing all network activities such as messages or error frames. For each massage there is the possibility of displaying the individual signal values. Graphics Window for graphical online display for values transmitted in messages and diagnostic requests, such as rpm or temperature values, over a time axis. Statistics Window for displaying useful network and node statistics, e.g. bus load on node and frame levels, burst counter/duration, counter/rate for frames and errors, controller states. Data Window for displaying preselected data, eg. numeric or bar graph data. Using the Diagnostic Feature Set contained in CANalyzer, you can analyze diagnostic communication in accordance with the KWP2000 or UDS standard. Here, CANalyzer can be used as the diagnostic tester for ECU diagnostics; parameterization is via ODX or CANdelaStudio description files. In addition, a complete OBD-II Tester is already integrated in CANalyzer. Use CANalyzer to log data and replay them for post-measurement analysis. The import/export functions allow time-independent processing of the logged bus communication. Logging is performed via special logging blocks in the measurement setup (1). You can also log directly from the Graphic Window (2) and Data Window (3). The logged data can be played back into the system for offline analysis (4). In addition to observing and analyzing the data traffic of ECUs, you can also use CANalyzer to influence the data traffic. To do this, you simply send messages from preconfigured user interfaces or define signal values in CANalyzer and send the related messages. BLF- and MDF4 logging files get unambiguous Measurement IDs and trigger IDs. CANalyzer now supports Ethernet connections to VN8900 devices. Improved usability with ribbon and tabs. During a state change, besides concrete values, you can also enter value ranges to map, for example a digital fuel indicator. The CANalyzer basic version is a comfortable tool for analyzing CAN networks. The CANalyzer multibus concept allows to operate CAN, LIN, Ethernet, FlexRay, and MOST simultaneously, provided the corresponding option is applied. Communication between different vehicles or between vehicles and the infrastructure is performed via WLAN standard IEEE 802.11p (ETSI ITS-G5 or IEEE 1609 WAVE). Option .Car2x extends CANalyzer by adding WLAN channels that comply with IEEE 802.11p. This permits direct analysis of both the Car2x-specific network and transport protocols and the application messages overlaid on them. With the .Ethernet option, you can expand CANalyzer to include support for Ethernet networks. The exclusive use of Ethernet interfaces prevents unwanted interference of the real-time Ethernet system by Windows or other applications. When using the VN5600 interface hardware family, it is also possible to monitor point-to-point connections, thus avoiding changes in the topology for measurement. CANalyzer .FlexRay gives you an universal tool for analyzing distributed real-time systems. It covers all applications from simple network analysis to focused troubleshooting of complex problems. The multibus approach enables simultaneous operation of the CAN, LIN, MOST, Ethernet and FlexRay network systems. The CANalyzer Option .LIN provides sophisticated analysis capabilities to monitor LIN networks. All network states and protocol errors are notified and interpreted in a simple way. The LIN communication can be logged in different file formats to perform offline analysis. A Master (or Slave node) can be easily simulated according to LDF. You can control a Master’s scheduler either interactively using the LIN Interactive Master block or by programming a CAPL script. The Trace window for LIN not only displays LIN frames, errors and events, but also shows all relevant LIN timings. CANalyzer .MOST is a convenient tool for analyzing the MOST bus with the familiar "look and feel" of the Vector tools. You can analyze all MOST channels. In addition, you can simultaneously include CAN networks in the analysis (multibus functionality). The tool supports you in interactive analysis of MOST communication, in which you can analyze – very flexibly and dynamically – either the real system or pre-recorded log files with the help of various representation forms. Furthermore, CANalyzer .MOST frees you of many routine tasks that you can describe in analysis scripts, and which can then be repeatedly executed by CANalyzer .MOST. They deliver reliable and reproducible analysis results. Gateway Development: The pure MOST variant of CANalyzer.MOST may be combined in any desired way with CAN, LIN, FlexRay and Ethernet variants. Analyses can cover all bus systems relevant for your gateway ECU and are based on a single, synchronized global clock. CANalyzer.J1939 can be used wherever J1939 networks are developed, diagnosed, and tested. Networks can also be simulated to a limited extent. CANalyzer.J1939 can be used to monitor and debug other J1939 networks, since the SAE J1939 specification is the basis for NMEA 2000, ISO 11783, ISO 11992 (Truck & Trailer), FMS (Fleet Management System) and GB/T 27930 networks. In combination with the .J1587 Option it offers a uniform approach to systems that extend across bus boundaries with a common time base. CANalyzer's powerful functionality together with the functional expansions for CANopen gives the user a tool that can be used both in the development of CANopen systems as well as their startup and maintenance. CANalyzer.CANopen makes high-performance, CANopen-specific functions for analysis and configuration available to the developer. This is a prerequisite for reliable and efficient interaction with CANopen networks. CANalyzer .Scope is an integrated oscilloscope solution achieved by combining a powerful 4-channel USB scope hardware with a standard Vector network interface. Up to 2 CAN FD or FlexRay networks or 4 LIN/sensor/IO signals can be simultaneously analyzed. The USB scope device is hardware synchronized with the network interfaces, so that all scope measurements have the same time base as CANalyzer. The option .Scope is tightly integrated into CANalyzer as a separate analysis window. This Scope window is divided in multi views providing user interfaces for configuration, data aquisition and post processing tasks. The most important views are the graph view of physical layer bus signals and the trace view showing a full protocol decode of data link layer. Both views are fully time synchronized with each other and can also be synchronized with other CANoe analysis windows such as Trace and Graphics. The option .Scope also allows the easily analysis of the network at a bit-level using either the interactive eye diagram or automated serial bitmask features. Both methods can be used in automated physical layers tests and are well-proven methods to quickly find network issues caused by adversely chosen network topologies, unfavourable cable charcteristics , EMC problems or incorrect network termination. The scope channels Ext. and Gen. are connected with a „Scope Trigger Y-Cable“ to HW-SYNC-input of Vector‘s network interfaces. CANalyzer .A429 is ideal for the analysis of ARINC 429 buses and of individual devices on up to 32 channels. Regardless of whether raw data or physical quantities are required – CANalyzer .A429 provides powerful analysis functions on all levels. Users reach their goals quickly and also get a clear overview in complex network constellations. CANalyzer .AFDX can be used efficiently for all needs related to startup and maintenance of AFDX® networks. Regardless of whether raw frames or payload contents are needed – CANalyzer .AFDX offers powerful analysis functions on all levels. Users quickly reach their goals and always have a clear picture of even complex network topologies. CANalyzer .AFDX utilizes optionally the VN5610A as USB interface or TTTech's PCI/PCIe variant AFDXEnd System T.
The AFDX® communication is described in ICD format. The aircraft manufacturer generally provides its suppliers with relevant description files. To ensure that this information is also usable in CANalyzer .AFDX, a converter is supplied that converts the ICD files into DBC files. The user adds these DBC files to a CANalyzer .AFDX configuration, which then enables access to symbolic information. The current AFDX® message traffic is shown in the Trace window. If databases are available, the display is symbolic and is based on information from the converted ICD files. A Virtual Link is then no longer visualized numerically by its ID, but instead by its name. The display of columns is user configurable, and three pre-configurable column layouts are available for quick switchover. Refined search functions ensure that the user does not lose sight of key information among the large number of messages. CANalyzer .CANaero covers all use areas from simple network analysis to focused troubleshooting of complex problems. The multi-bus approach lets you simultaneously operate multiple channels, different bus systems such as CAN, Ethernet and AFDX® as well as different protocols. CANalyzer .CANaero may be combined with other options such as AFDX® (ARINC 664), Ethernet and CANopen. It is intuitively operated based on a displayed block diagram that graphically depicts the data flow from the bus over the PC interface to the various evaluation windows on the screen and to the log file. The system is parameterized in this block diagram. In addition, it is possible to place and configure function blocks here, such as filter, generator or replay blocks. Symbolic object-oriented monitoring of communication by interpreting the various message formats in a Trace Window. Communication services such as Normal Operation Data, Emergency Events or Node Services are interpreted differently according to the specific service and are symbolically displayed. A database with messages according to specification. Application-specific data may be stored in this database. Symbolic names may be assigned to all data. The "Professional" variant provides all applications – from simple observation of the network traffic to complex analysis and stimulation of heterogeneous systems. All functions and extensions are provided with unlimited access. The "Expert" variant is ideal for all standard applications, and it provides all functions and extensions with unlimited access. Only the creation and execution of CAPL programs is not supported. The "Fundamental" variant is well-suited for simple applications. It provides all interactive standard functions for this purpose. However, not supported are programmability, diagnostic functions and user control panels. 1 CANalyzer benefits from higher clock rates rather than higher number of cores. Webinar recording: "CANoe/CANalyzer 11.0 - What is new?" Vector offers many different opportunities for you to build your knowledge of CANalyzer and broadening it. We recommend our CANalyzer Basic Workshop as an entry-level course in CANalyzer. It is best to take this basic course before attending our advanced training course. However, you may register for any of the courses independently. Go ahead and take a look at our training portal to see an overview of all CANalyzer trainings.